I love making quick dinners that don’t take a lot of prep or cooking time, especially on busy days! 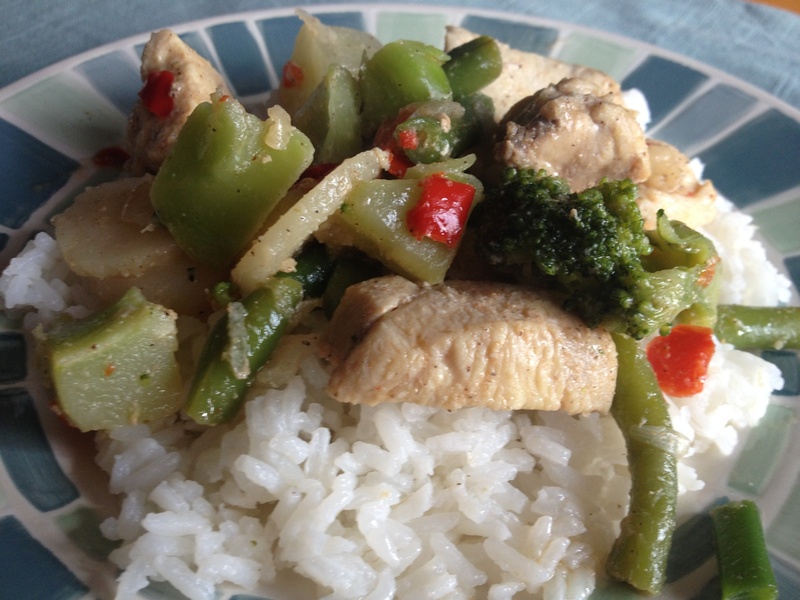 Chicken Stir-Fry is one of my favorite. There are just a handful of ingredients, it’s super easy to make, and few dishes are used so it’s a quick clean-up. Since I normally serve it over rice, it is always a huge hit with my husband. And since he tends to love the stir-fry vegetable blends (peppers, water chestnuts, pea pods, etc.) it’s a win-win. However, I do have to warn you….this last time I bought a stir-fry blend that had green beans in it. I will probably never do that again. For me, the green beans were a little mushy, which I did not care for at all. My husband didn’t mind though. Despite the mushy green beans, it was a great dinner! Sprinkle chicken on both sides with sea salt, pepper and garlic powder. Cut chicken into bite-sized pieces. Heat oil in a large skillet or wok. 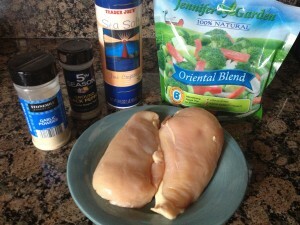 Add chicken and stir-fry for 6-8 minutes, or until chicken is completely cooked through. Remove chicken from pan and keep warm. Add vegetables to skillet or wok. Stir-fry for 6-8 minutes, or until they are tender. (You can also steam these while the chicken is cooking and then just add them to the chicken when they are done). You may season vegetables with salt, pepper and garlic powder if desired. Add chicken to the vegetables. Mix ingredients together. Serve hot over rice or noodles. This entry was posted in Recipes and tagged chicken stir fry. Bookmark the permalink.